After school on Friday we took the train together to Cardiff. On arrival we could see our hotel from the train station so it was very close and easy to walk to. As you can tell from it’s name this hotel is situated in the centre of Cardiff. We’re used to the hustle and bustle of Cardiff so enjoyed the atmosphere but if you want a hotel in a quieter area consider Cardiff Atlantic Wharf, saying that, once in our rooms we found it quiet. As we are a family of 6, we require two rooms each time we stay in a Travelodge. We were very pleased that they had managed to book rooms next door to each other. The staff were friendly and the room was spacious and clean with everything we needed. We went out for a meal before we settled for the night and were spoilt for choice with all the restaurants in Cardiff. We ended up eating nearby in the Brewery Quarter. On our way back to the hotel a passerby gave this hat to the kids- here mum models it well! We settled down and watched Comic Relief together and then went to our own rooms for a good night’s sleep ready for our adventure the following day. Personally I do prefer the Travelodge hotel’s that have a bar and restaurant and therefore offer a cooked breakfast (I love the vegan sausages) but we did know when we booked that this hotel only did the grab and go breakfast boxes so that was fine, especially as we had to leave early for our trail. I could only have the juice from my box so it would be great if they could add fresh fruit to these in the future or provide vegan breakfast bars. The kids were happy with their boxes and what they didn’t eat in the morning we could pack for snacks throughout the day. We finished our breakfast, got ready for the day, checked out and were off on our Roald Dahl adventure. Armed with our map and our rucksacks on our back we were off! Instead of taking the short route up Mill Lane, we decided to take the scenic route past St Mary Street Cardiff Market instead. We were delighted to see a sign offering “Vegan Chelsea Buns”. As we neared the stall they told us that they sold even more vegan bakes. We ended up choosing the flapjack- it was delicious! If anyone knows the name of the market stall please let me know. Walking the longer route had other advantages- we got to see more sights, such as St John the Baptist City Church. We then decided we may as well walk all the way to the castle while we were heading that way so we had a mini tour of the Cardiff sights too! We walked back upon ourselves and came to our first destination- The Cardiff Story Museum on the Hayes. A visit to the Cardiff Story Museum, as part of the Roald Dahl Trail, is useful to find out what life was like in Cardiff in the 1880’s when Dahl’s father, Harald Dahl first emigrated here to the time when Dahl himself lived here, from his birth in 1916. We found out about the different reasons why people emigrated to this area and all the different communities that made up Cardiff. It was very interesting. There was lots of information about the different industries in Cardiff, including shipping and transporting materials. The kids planned their own city- a very good task to make you you think about what’s really important in each area. We had planned to catch the train from Cardiff Central to Danescourt. Somehow we ended up to catching the train at Queen’s Street instead. As I’ve mentioned, we like the scenic route! The train journeys gave us the chance to read extracts from our copy of Boy: Tales of Childhood. I had put post it notes on all the pages that mentioned the places we would visit. One place that you can visit but we didn’t venture that far is Ty Mynydd (CF15 8AF) where the Dahl family lived from 1917 to 1921, in what was then a large Victorian house on a 150 acre farm. If you want to visit here stay on the train until Radyr. We instead got off at Danescourt. The day of our tour was very warm, especially while walking with backpacks. We had lots of water and sit down breaks along the way- sometimes you have to stop and smell the daisies! From Danescourt Train Station (Cardiff CF5 2RX) we walked to St John’s Church (CF5 2SH). Along the way we spotted a park which would make a great play stop. Eventually we got to St John’s Church. I felt quite in awe knowing that Roald Dahl had actually been to this place. I reminded the kids that they had to be respectful as this was a religious building and also a graveyard. As you walk towards the church take the right fork to find the impressive pink granite cross that marks the place where Roald Dahl’s father, Harald Dahl and his sister, Astri, lay. When his mother Sofie died in 1967, her ashes were scattered here too. “In 1920, when I was still only three, my mother’s eldest child, my own sister Astri, died from appendicitis. She was seven years old when she died, which was also the age of my own eldest daughter, Olivia, when she died from measles 42 years later. With hindsight, it’s sad to think that Harald Dahl never got to see the success that his son had in later life, how much joy he has given to children and adults over the world over many years past and many more to come. It’s quite incredible. We had a few quiet moments by the resting place and then turned to leave. Roald Dahl himself is buried in St Peter and St Paul’s Church in Great Missenden,Buckinghamshire, England, where he lived in later years. 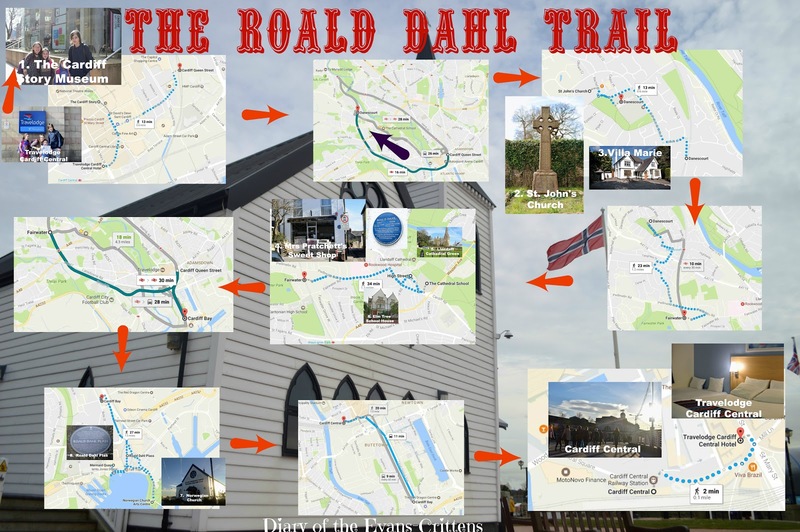 The Roald Dahl Museum is also located in this area and I plan to visit here too. Just outside the Church yard is a pub and restaurant, The Radyr Court, in case you need refreshments. From the Churchyard, you can also walk to Ty Gwynne, Villa Marie (CF5 2LE), to see where Roald Dahl was born on September 13th, 1916. We then caught the train back from Danescourt to Fairwater. You can walk this route if you prefer. I’m not sure why but I was most looking forward to seeing Mrs Pratchett’s Sweet Shop, even though I know that it is now a Chinese takeaway instead (currently closed). From Fairwater Station we walked past some interesting old buildings, such as Trenewydd, a Victorian home later used as offices but which has now sadly fell into disrepair. Izzy was quite intrigued with the plant growing out of the chimney and hoped it didn’t hurt Santa too much! We walked up Fairwater Road and then turned left on the High Street, looking out for “The Great Wall” Chinese Takeaway. We found it! Unfortunately there is building work currently taking place so we couldn’t get as close as I planned. Wouldn’t it be lovely if they were restoring it to an old fashioned sweet shop again? The blue plaque that we were looking for! We had found Mrs Pratchett’s Sweet Shop! The sweet shop in Llandaff in the year of 1923 was the very centre of our lives. To us, it was what a bar is to a drunk, or a church is to a Bishop. Without it, there would have been little to live for. But it had one terrible drawback, this sweet shop. The woman who owned it was a horror. We hated her and we had good reason for doing so. As I knew this building was no longer a sweet shop I had packed some of Dahl’s favourite sweets in my rucksack for us to enjoy – without having to cope with Mrs Pratchett’s dirty fingers in the jar! My own favourites were Sherbet Suckers or Liquorice Bootlaces. I gave the kids the closest thing- Sherbet Fountains. They now come in a firm plastic packaging. I miss the paper wrapping from “my day”. …When I saw Mrs. Pratchett turn her head away for a couple of seconds to fish a Sherbet Sucker out of the box, I lifted the heavy glass lid of the Gobstopper jar and dropped the mouse in. Then I replaced the lid as silently as possible. My heart was thumping like mad and my hands had gone all sweaty. From here you can walk to Elm Tree School House ( CF5 2AG) where Dahl attended prep school until the age of 9. You can also see Cumberland Lodge (CF5 2YD) where the Dahl family lived after Harald died. Roald Dahl attended Llandaff Cathedral School. This is now a collection of houses called “The Cathedral Green”. The current Llandaff Cathedral school is just up Chapel Road from Mrs Pratchett’s Sweet Shop. There is lots to see in Llandaff, a city within a city. Walking on from the Sweet Shop, we passed The Old Bishop’s Palace and lovely tea rooms. Then we got to the Llandaff Cathedral, which we only had time to see in passing. There were benches overlooking the Cathedral for another much needed rest (and more sweets in the name of Roald Dahl research, of course!). Next to the Cathedral is the Llandaff War Memorial, the ruins of a 13th Century Bell Tower. We also saw a statue of James Rice Buckley, the Archdeacon of Llandaff from 1913 to 1924) by William Goscombe John. Roald Dahl, the school boy, used to walk across this Cathedral Green every day on his way to school. After exploring Fairwater we walked back to the train station. From Fairwater Station we caught the train to Cardiff Queen Street, then Cardiff Bay. From Cardiff Bay Station we walked along the bay to the Norwegian Church and Art’s Centre. Dahl and his sisters were Christened here and worshipped here. Roald Dahl was president of the Norwegian Church Preservation Trust but sadly died on 23rd November 1990, at his home in Buckinghamshire, before the reconstruction of the church was completed. The Church also houses a cafe and a gallery. Roald Dahl Plas was named as such to commemorate the much loved Cardiff born author. It’s a lively part of Cardiff where there are often events taking place. On the Bay you can also visit where Harald Dahl first set up his successful shipping business, Aadnesson & Dahl at Pier Head Chambers, 3 Bute Street (now Mermaid Quay) (CF10 5BZ). Cardiff Bay is the perfect place to stop for a meal and drink while enjoying the marina views. We then took the train back to Cardiff Cental (via Queen Street). If you’re staying another night in Travelodge Cardiff Central you could head back there. Sadly, it was the end of our Cardiff adventure so we went off to catch our train home. Hopefully we’ll go on another weekend adventure soon. We had a lovely day exploring the Roald Dahl hot spots of Llandaff and Cardiff. I would space this tour over two days next time as there is so much to see. We headed back to our home in Pembrokeshire, which also has a link to Roald Dahl as he used to holiday in Tenby each year with his mum and sisters. We’re also keen to visit Norway and discover where he spent his Summer Holidays, especially “the magic Island” of Tjøme. See: All Roald Dahl sites mentioned above are free to visit. Please respect privacy at the private homes and the Church and Cathedral. We were guests of Travelodge. All words and opinions are our own.